Subscribing to a few fly fishing magazines, it's always enjoyable to see the occasional familiar face and/or name tucked within the pages. 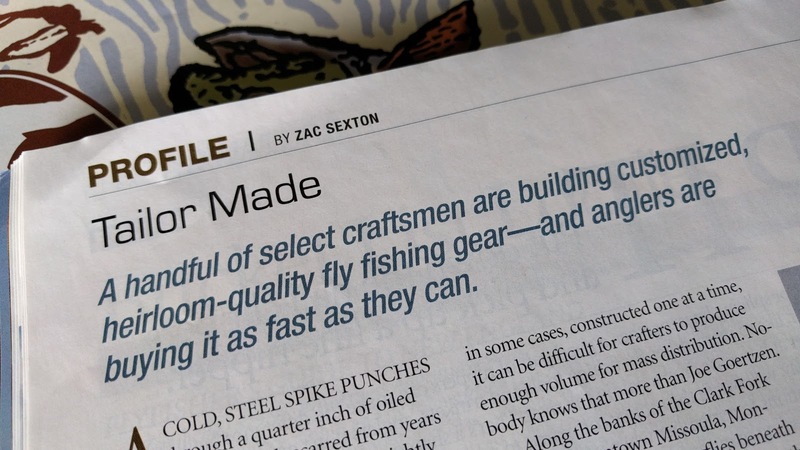 In this month's American Angler, Zac Sexton wrote a piece on several small businessmen making names for themselves in the fly fishing industry such as Joe Goertzen (Goertzen Adventure Equipment), and friend of the Troutrageous! blog, Scott Hunter (Vedavoo). 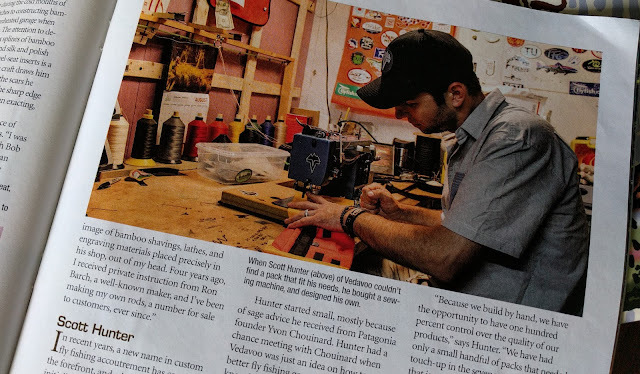 It was also pretty rad to see Cameron Mortenson from The Fiberglass Manifesto blog briefly mentioned as helping popularize leathersmith Lee Slikkers' bamboo rods, custom reel cases, and fly wallets. It's refreshing to find small batch artists receiving recognition of their skills in a large publication such as this. You'll not only find out more about the backgrounds of each of the three featured, but there's also a nice inset on page 20 that notes about 10 additional craftsmen. If you have access to the November/December issue of American Angler, it's definitely worth a look, especially if you're in the market for a special piece of fly fishing gear that will likely last a lifetime.